It’s the kind of story I would expect to be shelved in “ Bad Fiction”, “Sick Humor” or “Tales of Skinhead Pastimes”. It’s not the kind of game that comes to mind when I picture California teenagers on a Sunday afternoon. “Beat the Jew” is a game created by Southern California high school students, who posted the rules on Facebook. The game involves one volunteer, “The Jew”, to be blindfolded and stranded on a highway while the other players, “the Nazis” drive by and try to capture and tackle the Jew. The Facebook page has since been taken down, but the game is thought to be alive and in play. I'm not sure which part of the story I find most horrifying. The KKK flavor of the game? The excuse of the teenagers who pled ignorance, claiming that they didn’t know the name of the game and didn’t think about the discriminatory undertones? The idea that, despite the page posting the rules being removed, the game is probably still being played at this moment? Or the comment of the Indio police spokesman stating, “assuming all people playing the game are willing participants, whether any criminal wrongdoing had been committed would depend on if participants using vehicles were following traffic laws. If they're driving, are they obeying the speed laws? Are they driving erratically? Then there are going to be complications." And that’s where the problem lies. It seems that we might be focusing on the cracks in the wall while the building collapses upon us. To me, it matters less if an actual punishable crime has been committed, and more that children believe this kind of game is fun. Even if we take all religious connections away, just the basis of the game is disturbing. Leaving a friend on the side of the highway so you can swoop around in your car to tackle him? Personally, I’d vote for monopoly or scrabble, both of which never seem to involve trips to the emergency room. But the part I can’t sit with, the issue that I have trailed around my ankles for the past three days, the section that I want to shake my fist at is this: The kids claiming that they didn’t realize how inappropriate the game was. I'm not buying it. Teenagers might be impulsive and rebellious. They may test the rules and stretch the boundaries until they snap. They might act crazy to get a reaction or sling slurs for the attention. They might be cruel for popularity points. But teenagers aren’t stupid. And we aren’t talking about kids being raised by Hitler or living on a commune by cult leaders. These are high school students in southern California, and I would bet that they knew better. I find it inconceivable that they could play “Beat the Jew” without it crossing their mind that this could perhaps be about beating a Jew!! Or that one could capture a blindfolded “Jew” player on the side of a highway and still not have any inkling that the game was eerily reminiscent of cattle carts transporting Jews off to imminent torture. Ignorance might be bliss, but ignorance is not an excuse for wrong doing. We don’t allow robbery if the thief wasn’t aware that a locked door is code for ‘Please Don’t Enter’. I'm guessing that the players either knew that the game was wrong and didn’t care, or knew the game was wrong and that’s exactly why they played. I don’t know. I do know that its easier for me to live in a world where I don’t have to imagine children bickering over who gets to be the Nazi. It’s easier for me to breathe when I envision today’s world as safer than during the 1930’s. I would rather believe that the players knew exactly what they were doing. Because to think that there are really people who don’t have any concept that ‘Beat the Jew’ is a sick game requires me to acknowledge that the distance between a game and reality can be far too close. Games often imitate life, until they stop pretending and transform into current events. Just like the hurtful truth cloaked in sarcastic humor, sadistic games can be rooted in history and prophetic futures. I know we live in a world of duality. Amidst the pain we find new seedlings of growth. Among the wounds, spotted rainbows. I don’t delude myself that the world I live in is always safe and fair, kind and loving. I might be naive, but I do know that even though we tout ourselves as freedom loving, progressive, and humanistic, there still are weeds of meaningless hate and fear-based discrimination. I'm not blind to the injustices and separation, the places we fail, the blind spots we ignore. But this ‘Beat the Jew’ game located my Achilles heel and burrowed deep. As a grandchild of Holocaust survivors, I carry the weight of their suffering next to a finely tuned anti-Semitism detector, glancing over my shoulder lest the S.S. officers be following me home. I avoid Holocaust memoirs and movies set in concentration camps in efforts to stifle my re-occurring nightmare. The scene my mind repeats in a loop, where I am sent to the left line while watching my family sent to the right, lining up for a gas ‘shower’, powerless to do anything other than watch. I nod and smile when I hear “It could never happen again”, mentally listing the genocides and mass murders, the torture and rampant anti-Semitism that makes the daily news. At least if the students knew how repulsive their game was, we have something to work with, something to teach, something to build on. Ignorance, especially ignorance with no desire for learning, becomes a breeding ground for intolerance. . But if Jews are just meaningless pawns to be captured, interchangeable with faceless ‘enemies’ and imaginary ‘bad guys’, then I am very afraid. I don’t know the students and I don’t know their motivation. I don’t know if there are blindfolded teenagers sitting on a California highway waiting for their friends to come capture them. I don’t know how to teach compassion and tolerance to unwilling pupils. But this I do know. I know that torture as entertainment doesn’t breed kindness. I know that education cracks the surface of ignorance. I know that being pro-active eliminates future regrets and that over-reaction is preferable to murmuring “How could this have happened again?” I know that we can plant trees in Israel and open Holocaust museums but still there those who wish to have us exterminated. I know that we can pass hate crime bills and lock our doors at night, but I also know that hatred can spread like wild fire, and fear is a reasonable response. 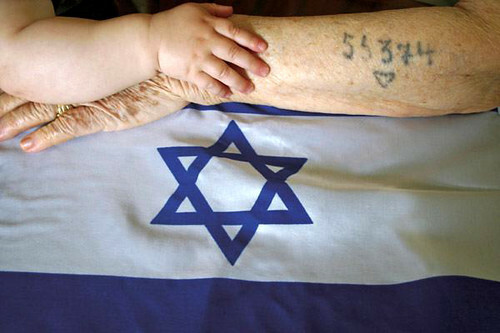 Maybe they’re right – that the Holocaust can never happen again. I hope they’re right. But while I hope, I will speak up, keep my eyes open, and point out the hints of cruelty, just in case. Because in the very least, I don’t want to be the one of the crowd that stood by and said nothing. First they came for the Jews. Then they came for the trade unionists.